Win a 1 Million fragrance package containing a 1.7 oz Eau de Toilette Spray and a 5.1 oz Shower Gel or a Lady Million fragrance package containing a 1.7 oz Eau de Parfum Spray and a 3.4 oz Body Lotion. Click betterbetsonline@gmail.com to enter your email address. Remember to put “Million” in the subject line. 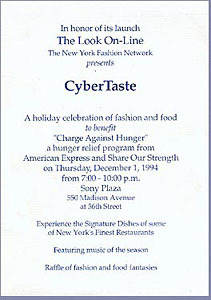 Register your e-mail before 11:59 PM EST, December 20, 2010. Two lucky winners will be chosen at random and notified by e-mail. 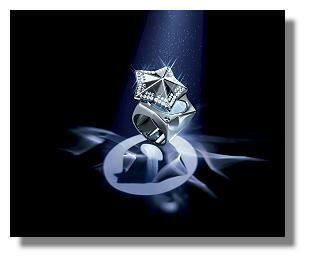 Paco Rabanne is providing these products for the purpose of this giveaway. For more holiday gifts for him go to our latest 'Better' Bets column: "Great Gifts For Guys". For the record, I wholeheartedly agree with Michael Kors who (according to www.style.com), took the opportunity during the course of his recent informal ‘pre-fall’ presentation, to plead with editors to come up with a better name for this season. In my opinion, it sounds like ‘pre-school’ and there surely must be a better term. As soon as I find one, I’ll let you know. That said, regardless of what you call it, designers both here and abroad are busy staging formal and informal presentations highlighting their newest creations, just months before the BIG FALL SHOWS in February. It certainly does feel as though the seasons are never ending, merging quickly from one to the next. 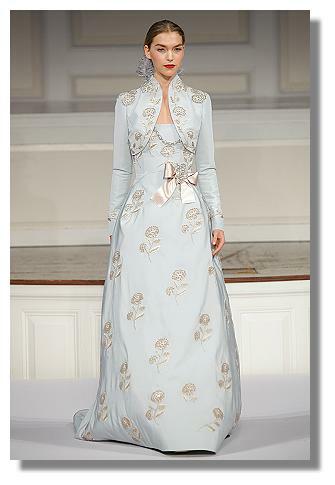 Oscar de la Renta is one designer who has traditionally staged formal runway shows for ALL seasons, including those of interim, mid seasons. And this time was no exception. While he broke with tradition as far as the time, showing at 2:30PM instead of 1PM, there was no surprise in terms of the venue, (583 Park Avenue) for his ‘pre-fall’ (hate the term) collection which was shown on Monday. Also unsurprising, was that the short, (59 pieces), to the point, well edited collection, (which was accessorized to the hilt with gold and onyx resin earrings; gold and topaz in addition to Plexiglas, wood, and crystal rondelle necklaces; gold, garnet cabochon and crystal pave rings; fabulously low heeled pointy toed pumps in addition to more predictable high heeled versions many of which were decorated or adorned with feathers), began at just a few minutes after 2:30PM and was over in approximately 20 minutes. It was filled with the sort of rich, opulent, feminine, highly textural clothes for day and evening, that have come to define the seemingly ageless designer: open work cashmere butterfly stitch and cashmere silk cardigans; ribbon tweed skirt suits; stretch wool faille embroidered dresses; art inspired dip dyes and color blocks; ostrich and Bird of Paradise feather borders; plenty of gold foil and gold lame but used in rather elegant, sporty ways; the abundant use of threadwork embroidery; silk crinkle chiffon pleated dresses and gowns; sturdy outerwear (one navy and black bi color double face cashgora duffle coat stood out, juxtaposed over a black double face wool crepe, lace, and silk crinkle chiffon dress); and of course, plenty of fur (Chinese lamb, broadtail, sable, and fox), in the form of sleeveless vests as well as fitted coats. And it was colorful. 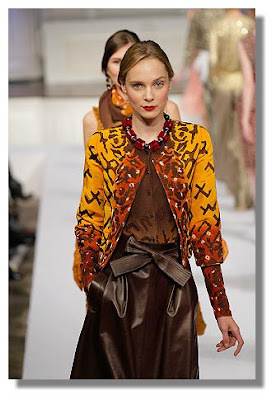 In fact, it was an endorsement of high voltage color and the show opened with a cashmere silk cardigan and stretch wool skirt in cactus (Kelly) green, followed by a silk crinkle chiffon blouse, cashgora jacket, and skirt in a shade of shocking pink so vivid, it would probably glow in the dark. The same shade appeared several other times, and was quite effective when used for a duo of silk crinkle chiffon dresses (both short and long). 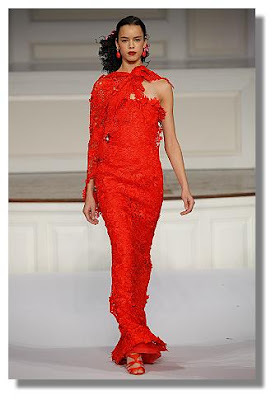 Also not in the least bit surprising, was the unmistakable nod to the unmistakably Spanish themes underlying the iconic works of Spanish couturier Cristobal Balenciaga: the voluminous infantas and dramatic gowns inspired by traditional cota de bolas; the use of cardinal (or scarlet) red and guipure lace; the matador inspired abbreviated bolero jackets; the lavishly embroidered florals; the sculptural outerwear, etc. Especially when you consider that Mr. ODLR worked for the famed designer early in his career, has always considered him a major source of inspiration, and conceived of ‘Balenciaga: Spanish Master’, the exhibit which is on view at the Queen Sophia Spanish Institute located on Park Avenue and 68th Street, just about 5 blocks north of 583 Park, where Oscar showed his pre-fall collection. 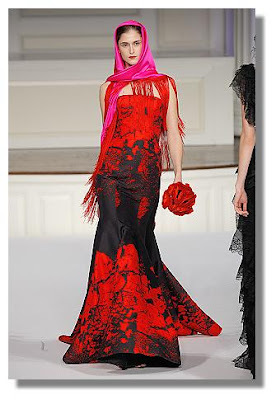 (Oscar de la Renta is chairman of the board of directors of the Queen Sophia Spanish Institute). Curated by Hamish Bowles, the exhibition is notable in that it is the first one to explore the impact of the rich history and heritage of Spain on the work of this famed creator. In fact, several weeks ago, I attended a small, intimate, and private showing hosted by The Friends of the Costume Institute of the Metropolitan Museum of Art, the highlight of which was a discussion with Hamish Bowles and Oscar de la Renta, both of whom spoke of the impact that Spain’s rich traditions, culture, and heritage had on the works of Cristobal Balenciaga. The Dominican Republic born designer told me of his unending love affair with Spain, specifically citing the city of Madrid, where he lived and worked for many years. But most poignantly, when I asked him to give me a few words to describe his upcoming fall 2011 line, in addition to noting that his collection has never been as successful as it is right now, he said he hopes to create “pretty, beautiful” clothes. Better Bets: Holiday Gift Giveaways! The perfect marriage of form and function. 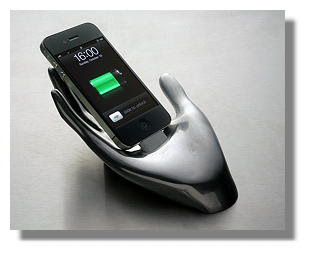 This sculpted silver hand charges your iPhone or iPod while plugged into your computer. Available at: http://www.yorkstreet.com/, $250 Win a Gimme Power iPhone/iPod Charger (Click betterbetsonline@gmail.com to enter your email address, remember to put “Charger” in the subject line). Register your e-mail before 11:59 EST, December 11, 2010. One lucky winner will be chosen at random and notified by e-mail. For more giveaways and holiday gift suggestions go to "Better Bets Holiday Gifts & Giveaways"
Ruth Finley Receives "Lifetime Achievement"
Fashion Calendar publisher Ruth Finley received "The Medal of Honor" from The National Arts Club last night in New York after a cocktail party and dinner for over 250 of her family, friends and associates. 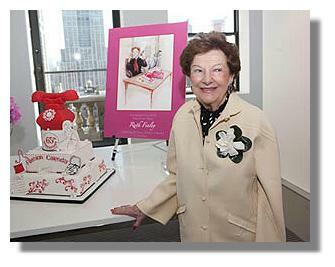 The award was presented to Ruth for her 65 years publishing the Fashion Calendar, which is called by many the "bible of the fashion industry"
Both Carolina Herrera and Mary Lou Luther spoke during the formal presentation and the award was given by Aldon James Jr. the President of the club. Some of the guests included Stan Herman, Steven Kolb, Peter Arnold, Mary Ann Restivo, Christina Neault, Owen Davidson, and Gayle Dizon. Past recipients of the award have included Geoffrey Beene, Carolina Herrera, Oleg Cassini, Arnold Scaasi, and Betsey Johnson. The National Arts Club was founded in 1898 by Charles deKay. He was the literary and art critic for The New York Times for 18 years. He and a group of distinguished artists and patrons conceived of a gathering place for artists, patrons and audiences in all the arts. The club is located in the historic Tilden Mansion at 15 Gramercy Park. The building was first built in the 1840's and then was given a massive overhaul in the 1870's by famed architect Calvert Vaus, who was also one of the designers of Central Park. Lookonline's Marilyn Kirschner spoke to Ruth in a video interview a number of years ago as one of our "Masters of Fashion" interviews. Click to play this very interesting and extensive video interview with Ruth Finley on the founding of the Fashion Calendar.